We are closed for the winter. See you in the spring! 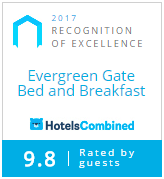 Evergreen Gate offers private and peaceful accommodation in a secluded location just half an hour north of Winnipeg and five minutes from Selkirk and Lockport, Manitoba, Canada. Private baths, wifi, individual (cable) TVs, outdoor hot tub, deck and delicious breakfast complement the three comfortable rooms, guest lounge, and kitchenette. Perfect for a getaway, family reunion, or base for visiting Winnipeg, the Interlake, or the beaches of Lake Winnipeg. Learn about the attractions and events in our diverse region. Plan your small wedding or elopement at Evergreen Gate! We look after the details so you can relax! Want to learn about local history? Let master tour guide Rob show you the historic structures, tell you the stories, or even guide you through the cemeteries! Rob's extensive knowledge of the area allows him to tailor-make a tour according to your specific interests. A portion of this fee will be donated to the community fund set up to promote appreciation of our heritage. Contact us now to book your specialized tour! As your hosts, we care about our guests, our environment, our community, and its history. We welcome you to our unique home. And please check out guest comments on Trip Advisor! Then please return to make your reservations here by email or phone.